The Capital One Spark Classic for Business currently has an Informr score of 7.3 out of 10. This score is based on our evaluation of 10 sources including reviews from users and the web's most trusted critics. 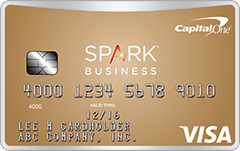 Capital One Spark Classic for Business is typically available to those with average credit scores (650 or greater). It is true that Spark Classic for Business only offers a 1% cash-back rewards program and has high APRs. But it has sever positives. All-in-all, Spark Classic is a very good business rewards credit card for those with average credit. The Spark Classic card doesn’t offer the lowest APR or juiciest rewards; but it does help cardholders with damaged credit build a better credit score, and earn a modest amount of cash back, so they can qualify for more generous cards over time. Business owners with average and lower credit have limited card options, many of which skimp on perks and charge high rates. This offer brings more value with 1% cash back for all purchases and no annual fee. The Capital One Spark Classic for Business card helps you earn unlimited cash back while building credit and paying for your business. It’s a simple card, but if you want to improve your business’s credit while earning a bit of cash back too, this card provides a way. We give this card low marks because it doesn’t offer many of the bells and whistles most business owners have come to expect from a credit card. Spark Classic can’t measure up to cards that offer premium rewards or stellar sign-up bonuses. The Capital One® Spark® Classic for Business is best for small business owners with average credit who want to earn rewards with minimal additional fees. We recommend this card for business owners who travel abroad and plan on having multiple employee cards, as you will not be charged any fees. If you need access to credit for your business, but don’t have the best credit score, the Capital One Spark Classic for Business card might be the best option for you. It offers 1% cash back on all of your purchases and gives you the chance to build or repair your credit by being a responsible borrower. The Capital One Spark Classic for Business card is great for small business owners looking to start building their business credit while also earning 1% cash back on every purchase.